Tahitian raised, French born, living in Australia, based in California........yep the life of an island nomad is that of model and surfer Hanalei Repontity. Before this shoot I only knew her from her work. Her beauty isn't typical. Her look can be strong, powerful and then at other times serene, mermaidic. The hair, the body, her ability to surf, it's an unusual combination and extremely intoxicating. To my delight she turns out to be quiet a special person too which I was soon to discover had a allot to do with her family and upbringing. Olivier and Rapheal were looking for an island life. 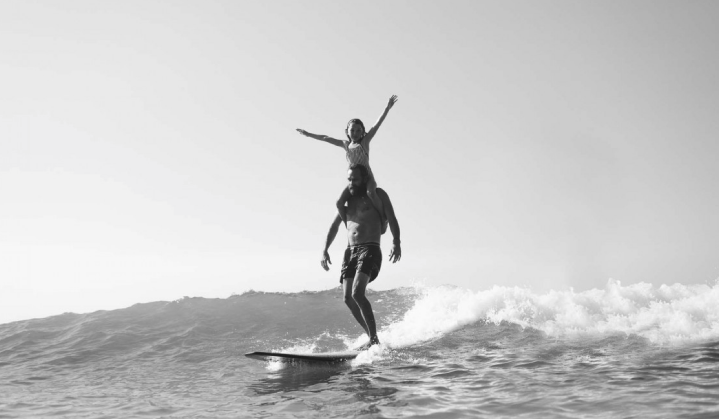 The goal was to create a world for their son Rome and daughter Hanalei where they would be raised with a love for surfing, a respect for the ocean and a connection to the planet. So they left the south of France for paradise life in Tahiti where Raph says surfing, giving and sharing was the key to their integration. Connected to the Polynesian people it was hard for them to say goodby some twenty years later but in order to stay a family unit and give their then teenage children the best that they could the island had to get a little bigger. Which brings us to now and their home Sydney, Australia. My friend Sybil told me to be careful, she said I would fall in love with them and want to be best friends, and shamelessly I do. Rome who had been working till 4am (he is a DJ, about to release his first EP) woke up for the early call with the best attitude of anyone I have ever seen in their twenties. Olivier who works long hours and shifts as a doctor gave up the better half of his precious Saturday to win the title of sweetest man alive. While Raphaele and Hanalei (partners and directors of the wetsuit/swim line ABYSSE) moved work, schedules and mountains to squeeze this in before Hanalei jetted back to the California. Much Gratitude. Between Byron, Bali and home they are still living the island life. Perhaps a little differently but still with the same soul. As a family Raphaele says they are the happiest when they are surfing together, that it's their way to connect, to laugh and share. It's where she says life is at its best, in the ocean, together. Karate black belt, not to be messed with!